An up-and-coming architecture student has designed an incredible shading system that rotates in three directions in accordance with sun’s position. Tyler Short designed the Penumbra kinetic shading system using traditional, static components that make the shading louvers swing out to create a deep shade. Take a look at this brilliant 3D animation that showcases his concept. 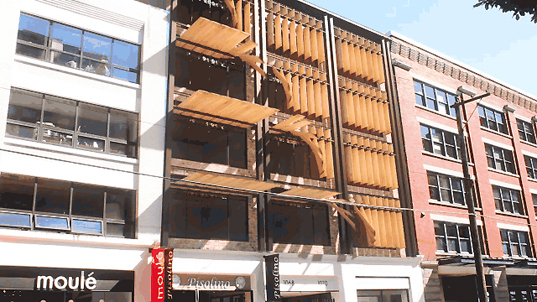 Penumbra – A Kinetic Daylighting and Shading System from Tyler Short on Vimeo. The vertical louvers rotate in three directions, both laterally and axially, and can independently pivot to maximize solar protection even when sun the sun is so high that traditional vertical louvers become ineffective. In the case of the Penumbra system, louvers can completely rotate upwards. The system can be computer-operated or manual. The design was conceived as a conceptual solution, one that would be interesting to see built. With so many moving parts, it might not be the most efficient shading solution, but the beautiful choreography of undulating form across the façade makes us want to see it in person.